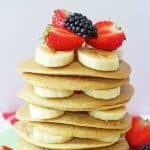 Delicious and nutritious Cottage Cheese Pancakes packed full of protein, slow releasing carbs and with no refined sugar. The perfect healthy breakfast or snack the whole family will love! Put all of the ingredients into a blender and blitz until smooth. Heat a frying pan on a medium heat on the hob. Rub a small amount of oil or butter into the pan to lightly grease it. Pour two tablespoons of the batter into the pan to make each pancake. Repeat until the pan is full. Cook the pancakes for 2-3 minutes on either side and then remove. Cook the remaining batter in the same way. Serve immediately with chopped fruit or store in the fridge covered for 2 days.